Most analysts of Middle East’s developments argue that after the beginning of Russia’s military operations in Syria, which are aimed at shoring up military forces of the Syrian President Bashar Assad’s government, an unwritten alliance has come into being among Iran, Russia, Syria and the Lebanese Hezbollah movement. As a result of this alliance, a single front has emerged with the final goal of keeping the Syrian government in place and destroying Islamist groups that are against Assad, including Daesh and al-Nusra Front. Iraq: Following the military invasion of Iraq by the United States and the overthrow of the country’s former dictator, Saddam Hussein, Americans dissolved the Iraqi army and its intelligence services. Due to this issue as well as weak management of the country by the occupying forces, the country became a major breeding ground for such extremist groups as al-Qaeda. Later on, widespread discontent with the performance of the former Iraqi prime minister, Nouri al-Maliki, and excessive demands by the country’s Sunni population in addition to financial support from rich Arab countries of the region, including Saudi Arabia, led to the emergence of Daesh terrorist group in Iraq. In view of the long border that Iran has with Iraq, this group can turn into a serious threat to Iran’s national security as well. Meanwhile, presence of Chechen militants from Caucasus region in Iraq and their possible return to Russia has been a major source of concern for Moscow. Afghanistan: There are fertile grounds in Afghanistan for the activities of various extremist groups such as Taliban, Hekmatyar network and Al-Qaeda due to extreme poverty in the country, religious fanaticism, weakness of the central government, mountainous terrain, and existence of large farms where poppy is cultivated. As a result, many reports have been published during the past months about the presence of covert and operational Daesh cells in Afghan provinces of Ghazni, Faryab, Badakhshan, and Sar-e Pol. The reports include pictures of a Daesh training camp in northern Afghanistan, named after the group’s former Iraq commander, Abu Musab al-Zarqawi. In view of the long border that Afghanistan has with Iran, if the activities of Daesh terrorists spread to border provinces of Iran, it can have serious security consequences for the Islamic Republic. On the other hand, Russia is not happy about extensive presence of Chechen, Uzbek, and Tajik militants in Afghanistan, especially along Afghanistan’s borders with Tajikistan and Turkmenistan; a region that Moscow considers as its backyard. Central Asia: The countries in Central Asia can be considered among important regions that have been of interest to a host of extremist Islamist groups following the collapse of the former Soviet Union. The presence of such extremist groups as the Islamic Movement of Uzbekistan, and the Islamic Renaissance Party of Tajikistan, in addition to extreme poverty and religious fanaticism among a large part of people in Central Asian countries, have provided a fertile ground for the activities of such extremist groups as Daesh. Given the presence of Daesh in Afghanistan’s border regions with Tajikistan and Turkmenistan, and widespread presence of immigrants from Tajikistan and other regional countries in Russia, infiltration of Central Asia by Daesh can have serious effects on the national security of Russia. Iran, on the other hand, has long border with Turkmenistan and can, therefore, be exposed to Daesh threat in its northeastern regions. Some developments, which have been considered as signs of presence of Daesh in Central Asia, include apprehension of 160 Daesh members in Tashkent by Uzbekistan’s security forces, extensive online activity of Daesh supporters on various websites, joining Daesh by Gulmurad Haliov, former commander of Tajikistan Interior Ministry’s special police force, presence of more than 3,000 militants from regional countries in Iraq and Syria, the announcement of solidarity with Daesh by the Islamic Renaissance Party of Tajikistan, and activities carried out by covert Daesh cells, which aim to recruit new members and promote the group’s ideas. On the whole, the fight against extremist groups in such countries as Iraq, Afghanistan and Central Asia, needs Iran and Russia to join hands and cooperate with crisis-hit countries in the region. 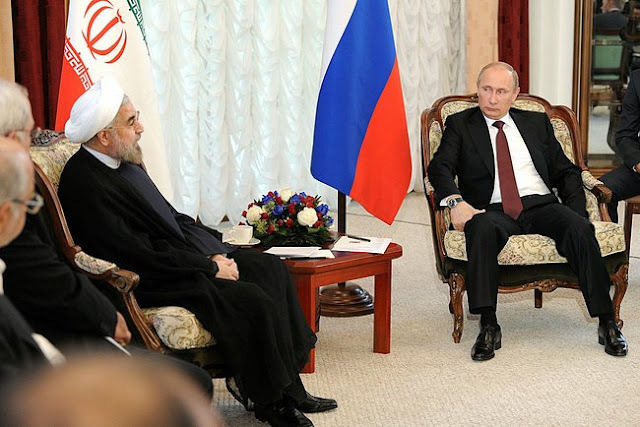 Iran and Russia can play supplementary roles. For example, with regard to Afghanistan, Iran can lend its support to grounds forces as well as the related paramilitary forces that are affiliated to the central government in Kabul, thus, taking a serious step in fighting such extremist groups as Daesh. Russia, for its part, can bolster the Afghan air force, which is suffering from major weaknesses due to reluctance of the United States to equip Afghanistan’s air force with modern technology.